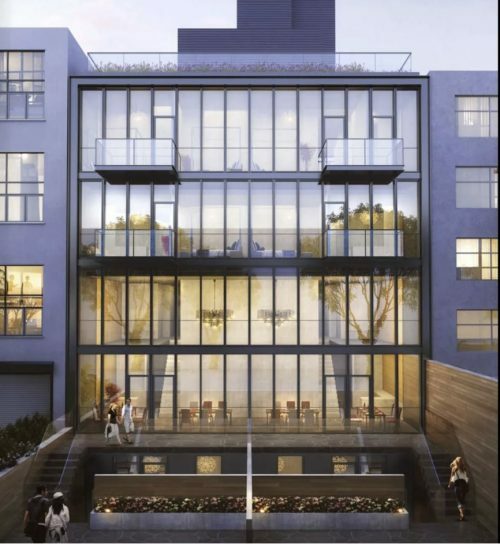 Sales have officially launched along with the release of new renderings of the”Bath Haus” condo development by Caro Enterprises. 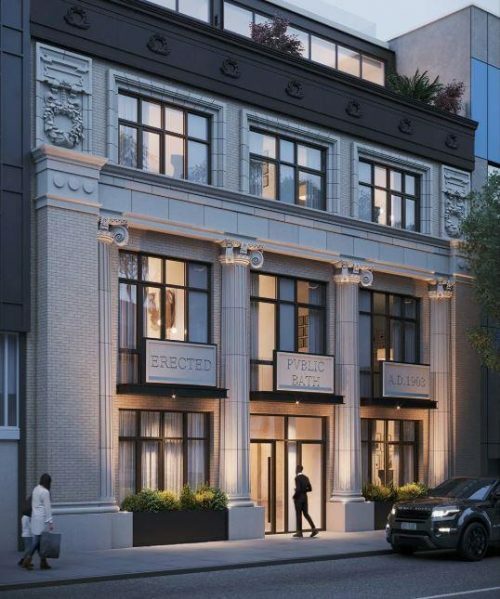 The luxury development is currently under construction at 139 Huron St. with 9 units hitting the market ranging in price from $750,000 to $3,300,000. The architectural firm Perkins Eastman is behind the redesign and have a global portfolio spanning the Hilton Lagos in Nigeria and the Abu Dhabi Court Complex in the UAE. A state mandate in 1895 required the construction of public baths in cities with more than 50,000 residents. The city’s poor were previously given access to floating baths off the shores of the East River, but they fell out of favor due to unsanitary pollution. 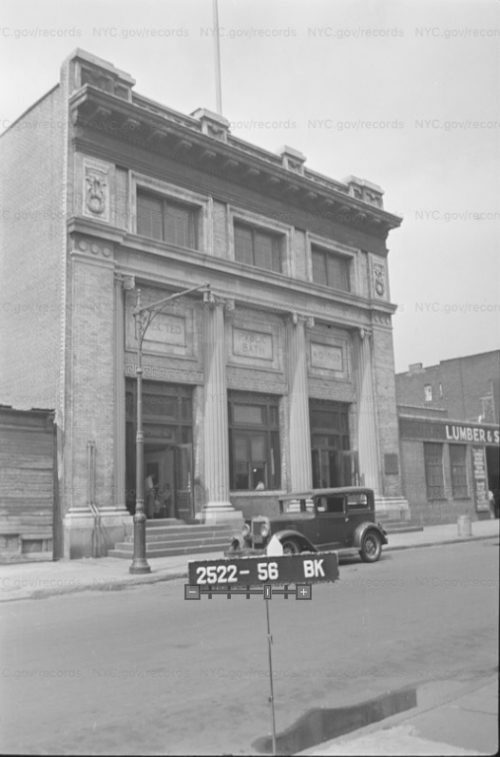 Greenpoint’s former Huron Street Bathhouse was built 1903, opened 1904 and closed 1960, it’s completion was a result of the City Beautiful Movement, which inspired ‘beautiful’ public architecture and increased municipal amenities to improve the living conditions of the city’s poorest residents. 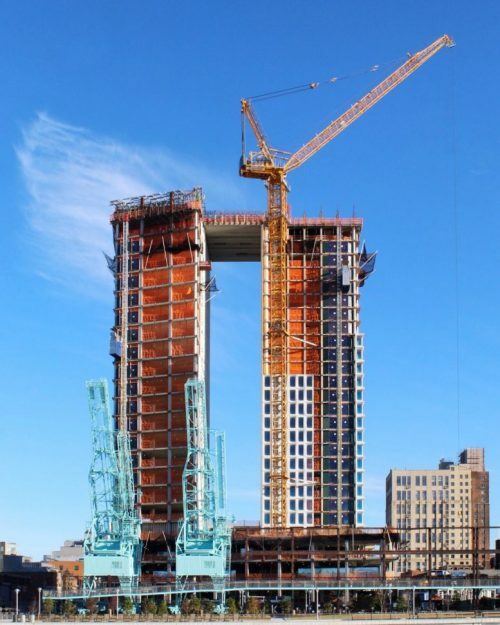 The residential high-rise construction along the contentious Greenpoint and Williamsburg waterfront is moving forward during the frigid winter months with towers advancing toward completion. 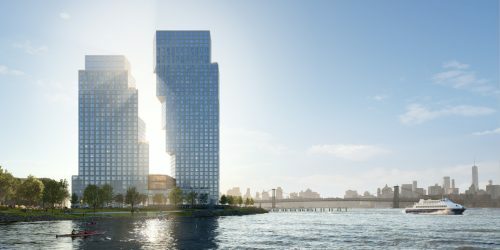 On the South Williamsburg waterfront, the rising towers at 1 S. 1st St. are being structurally connected, as YIMBY reports. 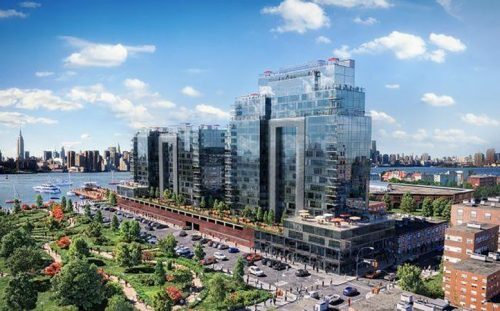 When completed, the conjoined building will have 330 apartments (66 will be affordable) spanning 462,000 square feet directly next to Domino Park. 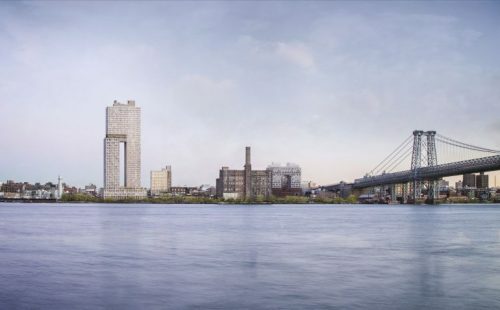 The completion date for 1 S. 1st St. hasn’t been announced but the incongruent tower will count as the second residential building at the former Domino Sugar Factory, where two more towers are planned at the southern end of the site. 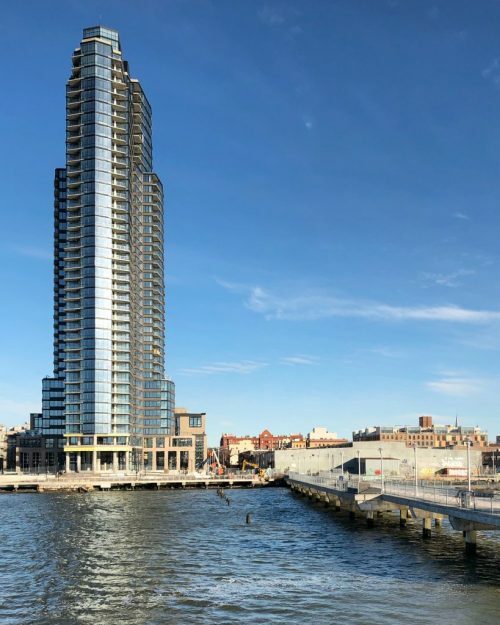 1.2 miles north of S. 1st St. along the waterfront, “The Greenpoint,” is “awaiting imminent completion” according to YIMBY, and the 392-f00t-tall shiny glass tower is currently open for leasing/selling with 500 condos and rentals. A one bedroom rental at the namesake 39-story tower is going to set you back as much as $4,020 per month. Quadrum Global filed plans this week with the Dept. 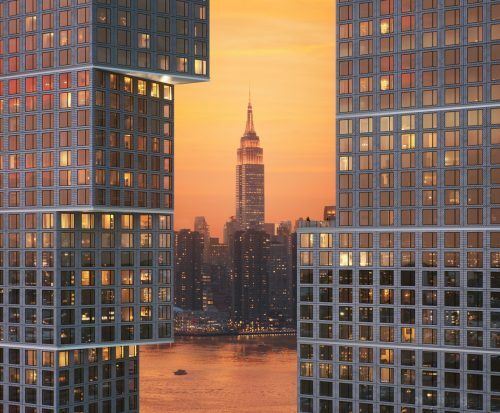 of Buildings for a 14-story, 150-foot tall residential building at 53 Huron St. (also known as 161 West St.) with 173 units spanning 178,000 square feet. 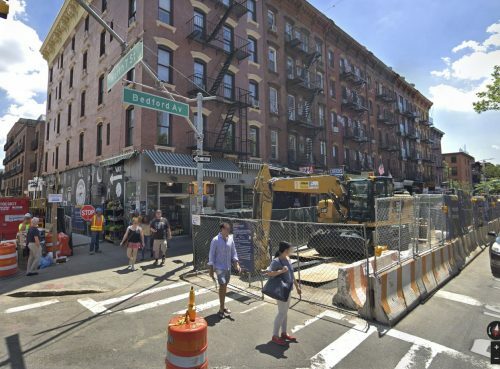 After 97 – 99 Clay St. was sold to developers in 2014, the 25 rent-stabilized tenants in the building reduced to five, following what current tenants claim has been a sustained effort by the new landlords to push them out through untenable demolition and construction conditions. 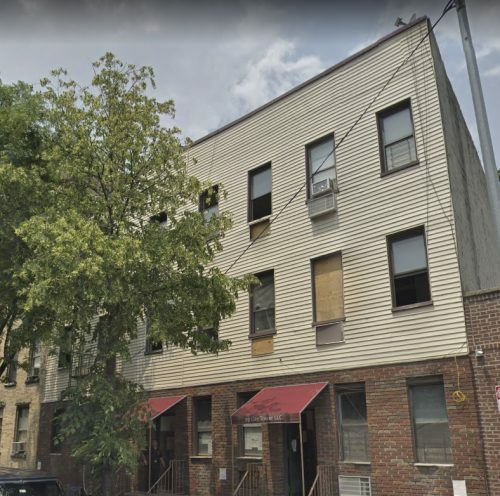 “The first thing that happened is that they changed the locks on Christmas day and didn’t tell us,” said Gretchen, who wishes to withhold her last name and continues to live in a rent-stabilized studio at 97 Clay St. despite alleged harassment.”We live between a halfway house and two homeless shelters and there was no front door for two months,” she said adding that one of the other tenants is a wheel-chair bound senior citizen, making him especially vulnerable. The new landlords originally planned to raze the building to make way for new construction, but with at least one tenant remaining in each of the buildings, the owners had to settle for renovations instead. Around February 2018, tenants say that demolition commenced and the living situation became increasingly hazardous. Complaints to the management company, Perfect Management, would simply result in a visit from the building’s super who tenants say has acted hostile toward their complaints. Perfect Management has not yet responded to Greenpointers. 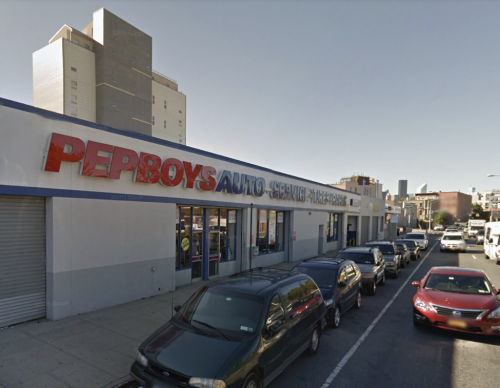 If you are dreaming of living in luxury directly on McGuinness Boulevard surrounded by gas stations in the footprint of a former Pep Boys Auto Shop, then you’re in luck. 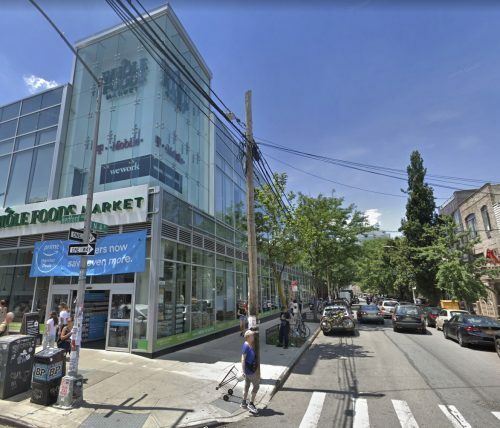 The city’s affordable housing lottery presents you the opportunity to apply for one of the 60 low and middle-income units at The Otto Greenpoint, a 197 unit “luxury” development at 211 McGuinness Blvd that markets itself as “community-forward.” The lottery is open through March 6. 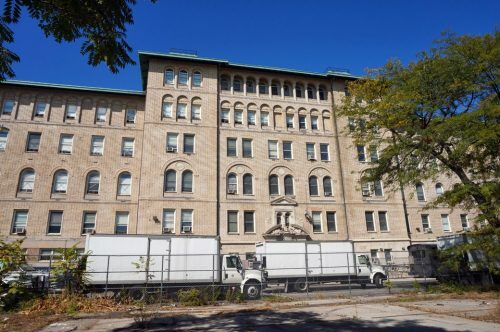 In a city critically short of both affordable housing and homeless shelters, the long-abandoned former Greenpoint hospital can help alleviate both severe shortages in North Brooklyn. Over a year ago, plans were finalized for the conversion of the site and soon the former hospital will serve the public in these critical areas. The Greenpoint Hospital served the community for 70 years and many locals were born in the hospital. Constructed of brick and limestone, the attractive main building includes elements of Romanesque Revival, Italianate and Neo-Classical architectural styles. After opening in 1914, the hospital closed in 1982 amidst much local anger. 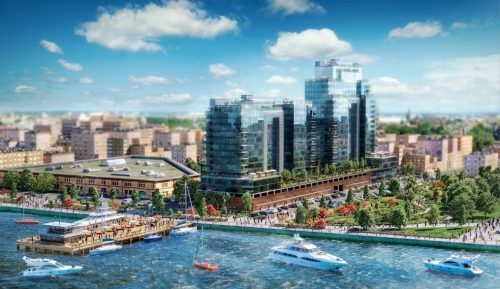 In a plan that includes a new homeless shelter and affordable apartments for low-income residents, the Hudson Companies, St. Nicks Alliance, and Project Renewal were chosen by the city’s Dept. of Housing Preservation and Development to redevelop the former Greenpoint Hospital site at 288 Jackson Street. 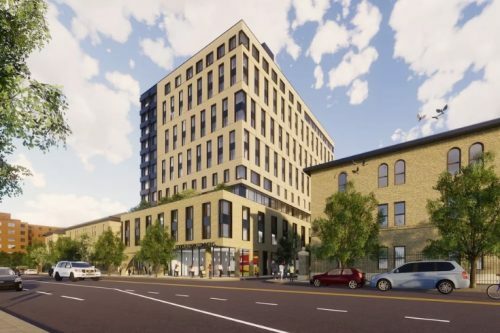 Magnusson Architecture and Planning and the firm Architecture Outfit will jointly develop 512 new units of affordable housing that will be housed in four separate buildings. The development will include an attractive campus with 21,500 square feet of communal space with a resident lounge, dining facilities, and a workforce development center. Completion of the project will involve two phases. In the first phase, the existing 200-bed shelter at the site will be moved to the southern portion of the development site in a rehabbed building. The first phase will also include construction of a new building with 267 apartments. 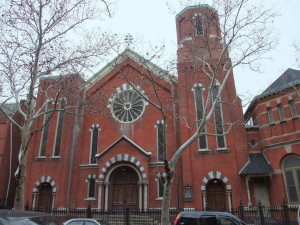 Will This Greenpoint Landmarked Church Become A Trophy Home? 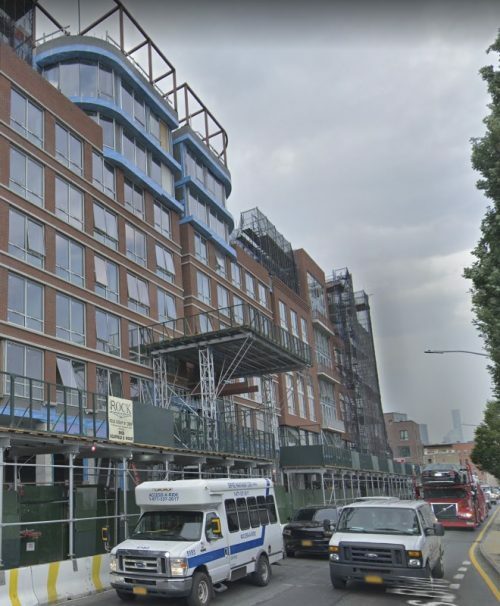 The Former St. Elias Church, the iconic 1870 landmark brick building at 145 Kent Street, is going to be a monster single-family home if developers have their way. The church has been sitting vacant for more than a decade. In 2007, Hirsch Enterprises, a company specializing in church conversions, purchased the property for $3.5 million, hoping to cash in on the red-hot local property market, but it has yet to see a return on its investment.